Achieving stylish and timeless interiors by collaboration with clients is foremost for licensed interior designer Davia Gallup. Functionality, livability and comfort are also key design principles. Davia has a unique talent for space-planning, often offering creative solutions to challenging structure and architectural issues. Her architect-like skill set and use of Computer-Aided Design (CAD) renderings lets clients see what their space will look like in advance! 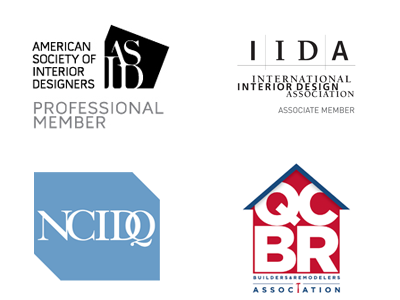 Davia has been a professional member of the American Society of Interior Designers (ASID) since 2000, the year she passed the National Council for Interior Design Qualification Exam (NCIDQ #18592). She has a bachelor of arts degree from the University of California Berkeley and completed the Interior Design program at Scott Community College. Here are some other fun personal facts about Davia and her interests. Hiked Nepal's Mt. Everest Base Camp Trail and summited Mt. Kilimanjaro. Author of "Running with Man's Best Friend," a book about how to run with your dog. Founder of Big Type Co., which manufactures large print address books for low-vision individuals. (Available at: http://www.bigtypeco.com). First place, Quad Cities Race for the Cure. Boston Marathon finisher (3:09) and second place in Woodlands Marathon (3:02). Designing for real life. Offering creative solutions making the design process easy, exciting and fun."